On this page, you will find all there is to know about the Software updates for Pokémon Duel (originally released on April 12th/19th 2016 in Japan, and January 24th in Europe and North America). If you’re looking for details on the events and content updates, click here! NB: since this page was created on February 9th 2017, we’re only listing updates released from that date onwards. How to download updates for Pokémon Duel for Android and iOS? We gave the game a Z-Powered Update! 1. Z-Moves are now here! 2. [UX]Necrozma and [EX]Celebi are here! 3. Monthly Point Rewards are here! 4. The Player Pass is here! 5. New items are here to help you better enjoy Pokémon Duel! 6. We’re giving you [UX] Pikachu, which can activate an exclusive Z-Move! 7. Each time you duel, any unlocking Time Boosters you have take less time to unlock! 8. 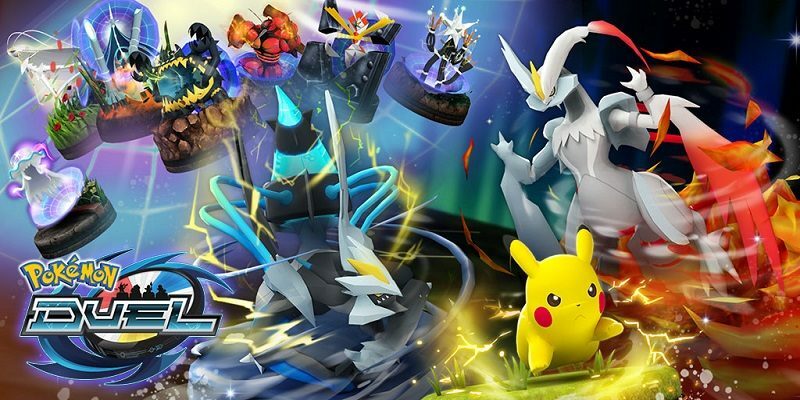 Mega Evolution figure sets are here! Holiday Season and New Year 2019 Events Are Here! Additional notes: for more details about the events, please make sure to check out this post! Adds preview for the new Z-Move mechanic. Check out this post for more details! adds a special pack allowing players to get the Shiny Charizard, Shiny Mega Charizard X, and Shiny Mega Charizard Y figures early. adds a special pack that allows you to get the Hexorus figure early. Mega Evolution has been revamped! League promotion rewards have been released! Special log-in bonuses are available! Very soon, certain cute figures will make their appearance! When adding a Mega Evolution Pokémon to your deck, the Mega Evolution plate for them will automatically be set at the start of the duel (in other words: it does not count towards the plate cost anymore, and you can have as many as you want in your deck). There’s one exception to this, however: the Meteoric Teachings plate for Mega Rayquaza. Movement raised from 1 to 2. Additional notes: update announced on February 24th. Additional notes: update announced on February 17th. [UX] Black Kyurem and [UX] White Kyurem are here as changes in form! A new event, tournaments, will be added soon! The Rocket Start Sale is back! Rocket Starter Boosters have been revamped! You are once again able to get them! Additional notes: this is the next major update for the game, releasing to celebrate the game’s 2nd Anniversary. More details coming soon. Metal Sphere (Plate): fixes issue causing damage not to be properly calculated. Figure alteration: wheel size for Miss decreased. Adds a new area: Ultra Space. Ultra Beasts can move into this space to have extra capabilities. Additonal notes: update now available! Additional notes: udpate is required to use the online features of the game. new items: UX rarity Cube, Ingot, and Rare Metal, offering bigger boosts. Additional notes: the update was announced on November 15th, more details coming soon. Update also adds new figures, plates, and a new booster: click here for more details! Additional notes: the update is required to play online. Additional notes: the update is required to play online. Click here for more details! Additional notes: the update is required to play online. You can find more details about it in this post! None, but the update adds new figures, a new booster, and more. Make sure to check out this post for more details! Update also adds new figures, boosters, plates, and more: click here for more details! A new rarity, UX, has been added! A new item will enable you to level up a figure to Lv. 10! Halls are a new function that will enhance Room Matches. The deck cost cap for plates has increased. A new League has been added. Additional notes: the update is required to play online. You can find more details about the new contents of this update in this post! Acrobatics: now allows you to select where Fletchling moves to. Additional notes: the update is required to play online. The update also adds some new figures, time-limited Booster packs, and more: click here for more details! The update also adds new Boosters and a new type of Plate: click here for more details! Hydro Pump, Wash out, and Miss: wheel size increased. Scratch and Miss: wheel size decreased. Adds new figures and a new plate: click here for more details! Also, this update adds new figures, plates, and special boosters: click here for more details! Plate alteration: Wait 3 added (triggered on use). new Ability: Chemical Pollen. When Venusaur is on the field, all Poisoned or Noxious Pokémon get MP-1. Additional notes: the update is required to play online. Also, new events are live: click here for more details! Wheel size of the Miss segment decreased. Notes: the update is required to use the online features of the game.